Building business and acquiring prosperity were St. Petersburg themes, and there were few competing visions. “'Everyone was too busy trying to make a living to argue, said C. Randolph Wedding, an up-and-coming architect. To read the St. Petersburg Times, one might get the idea that the entire city was awash with cheery optimism. Even the daily weather reports featured a cartoon pelican and homespun chitchat, aimed mostly at calling attention to the climate while taking every opportunity to point out seasonal snowstorms in northern states. On a day of expected rain and relatively cool temperatures, it was routine to run headlines such as “Dismal Type Weather” with a “kicker" head in smaller type above the main headline, reading “Rarity of Rarities." The little weather features amounted to a kind of journalistic boosterism, as editors expected visitors to mail copies to friends and relatives up north. Bragging about the “Sunshine City” was not limited to paid professionals, of course. Routinely, gloating visitors and new residents sent “back home” photos of beach outings or swimming pool parties conducted during the winter holiday period when much of the rest of the nation froze. 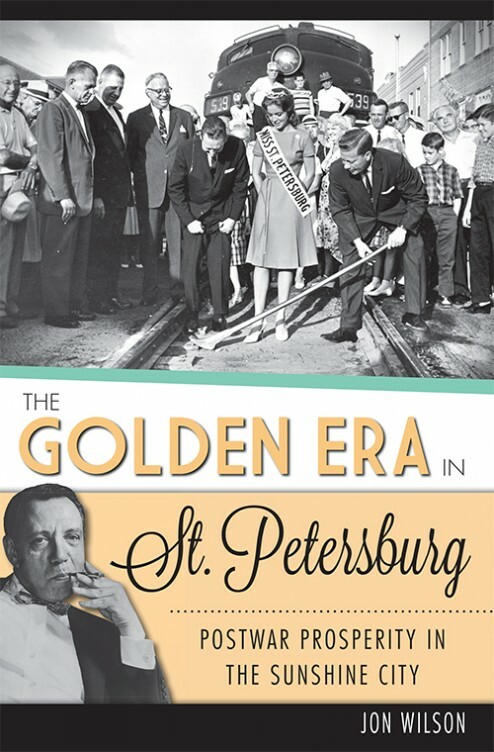 St. Petersburg, according to Davenport, became the first resort city in the world to use TV as a promotional tool. But nothing could beat the aggressive, systematic drum beating undertaken by the chamber. Chamber manager William Davenport Sr., in much lower-key fashion, was to postwar St. Petersburg what arch promoter John Lodwick was to the city during the 1920s. During his tenure as manager from 1942 to 1962, Davenport promoted the coming of the Sunshine Skyway, the elimination of Gandy Bridge tolls and the course of U.S. Highway 19 through the city. St. Petersburg, according to Davenport, became the first resort city in the world to use TV as a promotional tool. Crews produced twenty-one shows in color and with sound; some 160 stations in the United States, Canada, Cuba and London aired them, and untold numbers of PTA groups and social clubs saw the films in 16mm projection. Produced in the late 1940s and early 1950s, breezily narrated by “television traveler” Burrell Smith, the short films carried such titles as The Tale of One City and Sunny Days. A 1947 video called Batter Up touted spring training and featured major league Hall of Fame player Honus Wagner greeting Al Lang, a former mayor who brought St. Petersburg its first preseason baseball.